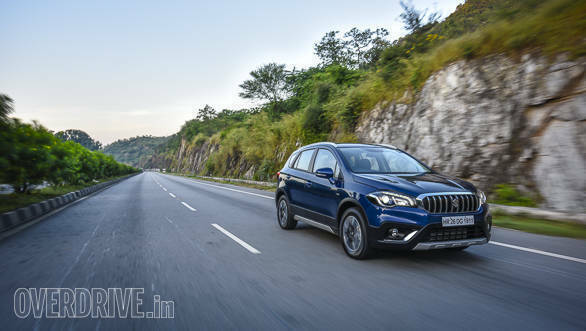 Maruti Suzuki recently launched the mildly updated 2018 model year version of the Maruti Suzuki S-Cross crossover in India. The changes to the car are mostly to improve safety. The S-Cross now gets rear parking sensors, a speed warning system and a passenger seatbelt warning function as standard across all of its four trims. Additionally, the lower-mid spec Delta trim now gets a smart key with push-button start. Other features on this variant include cruise control, automatic climate control, rear windscreen washer and wiper and auto-folding outer rear view mirrors. Consequently, the S-Cross' prices have also increased. The base Sigma trim now costs Rs 8.85 lakh while the top-spec Alpha variant now goes for Rs 11.45 lakh. Variant-wise prices have increased anywhere from Rs 13,000 to Rs 55,000. All prices are ex-showroom Delhi. Mechanically, the S-Cross remains unchanged. It is available with the 90PS/200Nm 1.3-litre diesel engine coupled with a Smart Hybrid Vehicle System that's already in use on the pre-facelift Maruti Ciaz and Ertiga.